Buying a new car is a fun and exciting process. You get to look at lots of stylish new models in the dealership showroom and take a few contenders out for a test drive. If you've already started researching and know that you want to drive a new Honda Accord, you're off to a great start. We'll help guide you through each one of these important steps that will lead drivers in Phoenix, Glendale, and Sun City to your next car. 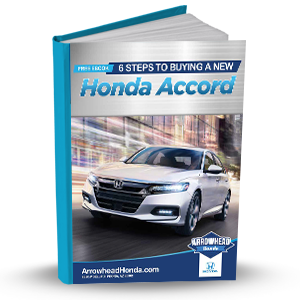 Download this FREE eBook, 6 Steps to Buying a New Honda Accord, from Arrowhead Honda and get started on shopping for a new midsize sedan today!